Quakers from Chelmsford, Oxford, Hastings, Cambridge and London are outside Chelmsford Crown Court today to support Brighton Quaker Lyndsay Burtonshaw and the other members of the #Stansted15, who will shortly be sentenced for preventing an immigration deportation flight. As a Sanctuary Meeting, Chelmsford Quakers are working to create a culture of welcome in Britain, end deportations and detention, and challenge racism in all its forms. Over the past six months they have also been looking after the Stansted defendants with hot drinks, food, accommodation, and upholding them in their prayers. We uphold the #Stansted15 as they receive their sentences today. 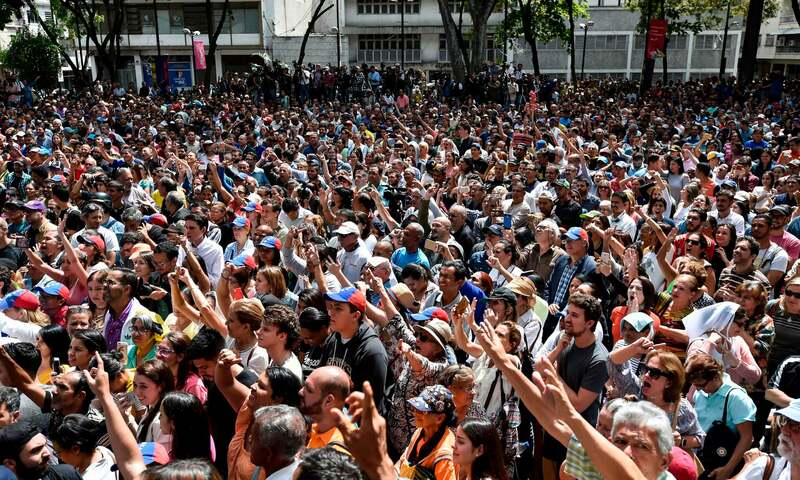 But I ask you to look at this photo of supporters of CIA poster-boy, the West’s puppet unelected “President” Juan Guaidó, taken at a Guaidó rally in Caracas two days ago and published yesterday in security services house journal The Guardian. Please take a really close look at the photo. Blow it up as big as you can. Scan individual people in the crowd, one by one. These are not the poor and most certainly not the starving. As it chances I have a great deal of life experience working amongst seriously deprived, hungry and despairing people. I know the gaunt face of want and the desperate glance of need. Look at these Guaidó supporters, one by one by one. This designer spectacled, well-coiffed, elegantly dressed, sleekly jowled group does not know hunger. This group does not know want. This is a proper right wing gathering, a gathering of the nicely off section of society. This is a group of those who have corruptly been siphoning Venezuela’s great wealth for decades and who want to make sure the gravy train flows properly in their direction again. It is, in short, a group of exactly the kind of people you would expect to support a CIA coup. Ohio Yearly Meeting of the Religious Society of Friends (Conservative) is a Quaker fellowship of nine local congregations (which we call “Meetings”). “Conservative” indicates that we stay close to the Christian Truth and Life upon which the Religious Society of Friends was founded in the mid 17thCentury. We gather together in stillness to wait expectantly on God.